At the Simply Health Great South Run in Portsmouth on Sunday Okehampton Running Club was represented by a single member, Hugh Robinson. This race, considered the world’s leading 10 mile race, has a fast flat course and attracts over 20,000 runners, with support from crowds all around the city. 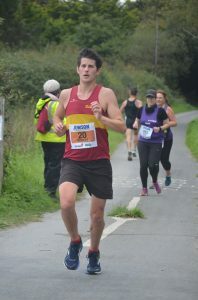 Having recently run a marathon pb at Barnstaple, Hugh showed he is still in great form with an outstanding run in his first ever 10 mile race, finishing in 1.02.48 to set the standard high for any future pb’s and come a very impressive 166th out of such a massive field. Saturday evening saw the start of the Wild Night Run winter night race series with the Night Templar 10k, held in Stover Country Park, Newton Abbot. 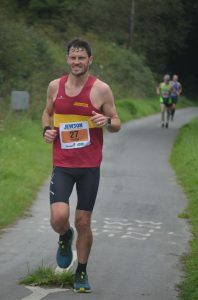 There were four Okehampton Running Club members who took part, with Tom Andrew first home, running a great race to finish inside the top twenty in a time of 47.33. Husband and wife Phil and Jo Turner ran together coming home in 1.00.57, Jo’s first race since having some achilles tendon problems. Liam Keen finished in 1.05.02, a good result after running the Great West Run the week before with little recent training. 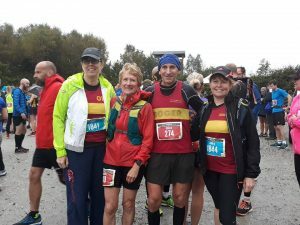 The Plym Trail Autumn Marathons took place over the weekend with two Okehampton runners, Geoff Hill and Roger Voaden competing on Saturday, while Roger did the double, running on both Saturday and Sunday. The marathon course is a quick up and down in Clearbrook village followed by two ‘out-and-back’ runs on cycle route 27, a disused railway line. With beautiful weather on both days giving excellent running conditions Roger finished day one in 3.20.31 to come third while Geoff Hill was fourth in 3.39.22. The second day saw Roger come home just four minutes slower in 3.24.02 to be placed first, beating the winner of Saturday’s race. There were two new pb’s set at parkruns on Saturday. Jane Richardson runs the Exeter park run most weekends and is running very strongly at present, so was pleased to find she’d shaved a few more seconds off her recent PB, finishing in 28.12. Jo Page was on holiday in Copenhagen where she took part in the Amager Fælled Parkrun and set a new PB of 20.40 over the fast flat course. 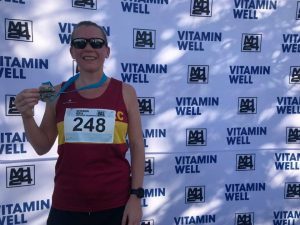 Jo Page was keen to get some more races under her belt while in Copenhagen and found a last minute place in a charity 10k, the Vitamin Well and MN24 10k. This was a two lap, flat course in Kalvebod Park in southern Copenhagen where Jo ran an excellent race on a slightly over-distance course to come fourth lady in a time of 44.36. Many thanks as always to Jane Jackson for your reporting and editing. 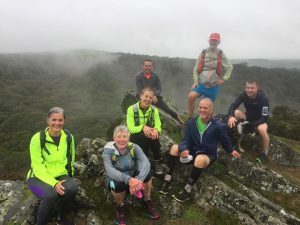 After two days of gale force winds and rain, the wind finally dropped, although the rain continued on Sunday morning for the two races that occupied Okehampton Running Club members. Down in Cornwall, the Eden Project Marathon and Half Marathon have become a firm fixture in the running calendar, where the hilly multi-terrain courses follow a challenging route through areas of spectacular mining heritage and beautiful countryside, taking in the spoil heaps known as the “Cornish Alps” and the old Luxulyan granite works now reclaimed by nature. 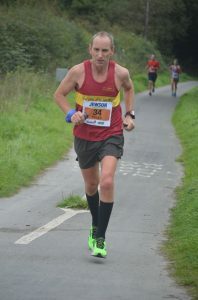 In the full marathon Okehampton was represented by the club’s most experienced marathon runner, Roger Voaden and a complete newcomer to the distance, Mags Jarvis. Despite having run for most of her life, Mags had never tried running a marathon, so at the age of 63 and having been diagnosed with Parkinson’s five years ago she decided to rectify this. Eden’s quite a tough course and wouldn’t be everyone’s choice for a marathon debut, but Mags prefers this type of terrain with its changes of pace and elevation, and luckily the rain stopped and the sun shone for the second half making it more enjoyable. Roger was happy to complete his 25th marathon this year, his 93rd in total in 3.37.25. Mags came home in 5.12.31, to be first FV60, an incredible and inspirational achievement. In the half marathon Alec Robinson was the first ORC home in a good time of 1.41.52, while Carole Cornwall and Katy Speak ran together as usual, finishing in 2.26.57, then staying on to cheer Mags home in the marathon. At the Great West Run Half Marathon in Exeter, there were a few less Okehampton runners than in recent years, but those who took part had some great results. Starting at the Exeter Arena, this half marathon has it all with a journey through the city centre, followed by pretty country lanes with stunning views across Exeter and a fantastic stadium finish. First ORC home was Rob Kelly with a run that came within 4 seconds of his his PB set here five years ago, with his time of 1.21.09 giving him 22nd place out of a field of over 2,200 runners. After setting a new PB over the flat Cardiff Half course last week, Hayden Bond had another terrific run here with the hills only slowing him down slightly to finish in 1.27.42. First ORC lady home was the ever improving Jo Page who continues to amaze her club mates with her ability to not only race so frequently but to get faster with every race. Her time of 1.33.15 knocked another four and a half minutes off the PB she set only three weeks ago at Disneyland Parisand set a new club record for the distance. Monika Richards was next in 1.52.12 with Paul Jelley coming home in 2.03,43. Christine Fritsch didn’t quite get the time she was aiming for, but still set a new PB here in 2.04.13. Rachael Hayden was pleased with her time of 2.15.21 which was faster than her Bristol Half time three weeks ago. Liam Keen was glad to complete in 2.24.45 having done very little running recently and Katie Bolt’s time of 2.31.10 was faster than her time round this course last year. Not forgetting off course the Autumnal moor running has started so well done for everyone braving the weather, but do all look out on our Facebook page for other regular meets. Thanks as always to Jane Jackson for your wonderful reporting. At the Cardiff Half Marathon on Sunday Okehampton’s Hayden Bond took part in a race he has been targeting and training hard for. This predominantly fast and flat course starts outside Cardiff Castle and heads down past Cardiff City Stadium then out to Penarth, taking in Penarth Marina before crossing the barrage into Cardiff Bay. From there it heads north out of the city with a loop around Roath Park Lake before the grandstand finish in the heart of the city at the Civic Centre. Hayden was aiming for his first sub-one hour thirty finish here which he achieved with an outstanding run to come home in 1.26.04, knocking four and a half minutes off his PB. 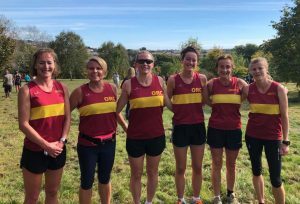 Last weekend saw the first fixture in the Westward League Cross Country series. 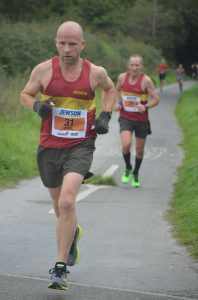 Held in Plymouth, this event always heralds in the Autumn for the many club runners who take part in the league throughout the winter, although Sunday’s race was held in summer-like conditions of warm sunshine with not a breath of wind. The course here is hilly but the bone dry ground made for easier running than in last year’s thick mud. The ladies were the first to run with three runners who had taken part in previous years and three newcomers. Jo Page, barely recovered from her superb run at the Barnstaple Marathon, was the first home finishing in an excellent position. She was followed by Sarah Marvin, finishing for once ahead of her daughter Molly who was next in, followed by League rookie Karen King who had a great first run. Jane Jackson, also with the Barnstaple marathon still in her legs, was next with newcomer Christine Fritsch just two places behind. 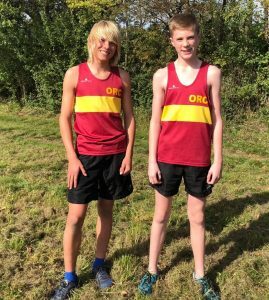 The club was well represented in the Under 15 boys race with two Okehampton runners trying the league for the first time. Sam Priday, had a brilliant run, despite having played rugby in the morning to storm home in fifth place with Harrison King, who is at the younger end of the age group, also running well. 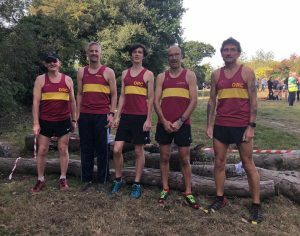 The men’s team was slightly depleted due to several usual league runners taking time off to recover from last week’s marathon, but those who did turn out ran well. Paul Crease was first in for the club with a fantastic run that gave him his highest placing ever, with a new member, Steven Sincock coming in next. Young Indigo Ramsey who was having his first league outing finished next followed by one of last year’s stalwarts Stuart Page. 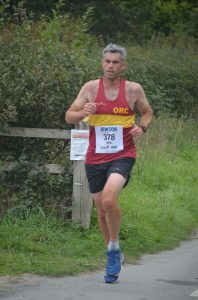 Inspired by his daughter Jo’s successes since joining the club, Ian Page also became a member last week and thoroughly enjoyed returning to the competitive League running scene of earlier years, finishing well cheered on by his new club mates. While some club runners were in Plymouth for the Westward League a lone ORC was there to take part in the Plymouth 10k. Despite having done very little training in recent months Cam Whitelaw ran a good race, shaving just a small amount off his previous PB to finish in 1.00.24. 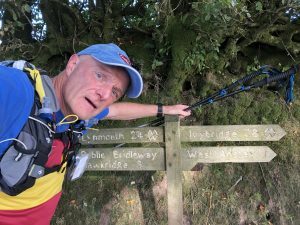 And finally, Robert’s personal account of his 100 mile marathon of marathons running the Two Moors way Ultra last weekend. “Last weekend I completed a 100 mile Ultra Marathon event, the Two Moors Way. This was an exceptional challenge and one that should carefully be considered if anyone want to attempt a similar event. The route starts at the Joe Turner statue on the Esplanade of Lynmouth and immediately there is a 150m steep climb out of the town before shortly breaking into open moor land. The route takes you over the open Cheriton Ridge, past Exe Head and down into the picturesque village of Simonsbath. After following the Barle River you come to the historic Tarr Steps. Large granite blocks of stone crossing the river. By this time I had run 20 Miles and ascended over 800m in 5hrs. As I exited Exmoor I made my way across Mid Devon through lanes and fields rolling across the beautiful Devonshire countryside. Crossing the North Devon link road after a short stop for a change of clothes, tend to feet and a welcome hot food before setting off into the setting sun. I passed through Witheridge before stopping at the third food stop in Morchard Bishop. 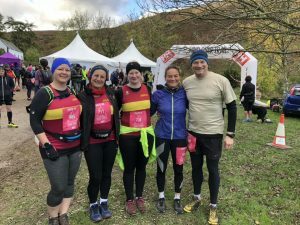 A considerable spread was laid on with hot chips and sandwiches, hot tea all the types of food these endurance runners need to maintain the calorific intake to keep powering themselves forward. A welcome greeting of fellow ORCs Gill and Phil Spinney who had volunteered to man this checkpoint boosted my spirits. I’d now climbed a total of 1600m, completed 43mile and had been moving for 11:30hrs. The night was well and truly upon me as I made my way to Drewsteignton. This section is regarded as the flat section despite its 550m ascent, but that is the nature of this trail. I arrived in Drewsteignton a bit later than planned at 03:30 on Sunday morning, and was met by another fellow ORC, Chris Turner who had opted to man this station throughout the night. Another welcome face, a short pep talk, more encouragement and off I went. 60 miles done and the distance was starting to take its toll. I continued on through Castle Drogo grounds, around Chagford and following the Teign River before climbing onto Chagford Common. I chose to walk through most of the night to avoid the risk of tripping and potential injury, however walking gave little respite to my aching body. The next stage was to make my way to the Warren Inn, high on Dartmoor where I rested a for short while and ate some hot porridge that I had been carrying all night, before setting off on the penultimate climb up and over the notorious Hamel Down. This is a steep ascent, across a high ridge before descending steeply to the outskirts of the beautiful Widecombe-on-the-Moor. As the afternoon approached I made my final stop at New Bridge where soup, sandwiches and cakes awaited. The final push through the village of Scorriton and the long, and never ending climb up and over Pupers Hill, followed by the long winding descent into Ivybridge was within my grasp. The winding descent along a granite path was like walking on needles and lasted for 6miles. The pain and the exhaustion was well and truly upon me. Fellow ORCs followed with excitement my tracking device on their computers as I neared the finish line. Totally exhausted I became disorientated and confused and had to dig very deep into the last reserves of energy to retrace my steps to reconnect with the right path into Ivybridge. As always, thank you Jane for your editing. 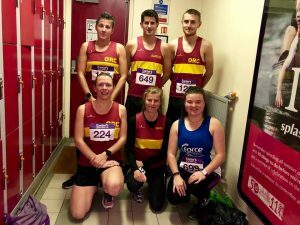 On Sunday Okehampton Running Club members enjoyed a hugely successful day at the fifth anniversary of the Barnstaple Marathon and Half Marathon. Organised by North Devon Road Runners, this event has established itself as a fast flat route which is largely traffic free. Starting in Rock Park, the marathoners do an out and back to Chivenor, on the Tarka Trail, and then out to Fremington, with a road section from there to Yelland followed by a return on the Tarka Trail, the half marathoners doing the second half of the marathon course. Being on the estuary the weather can be influential on this race, but Sunday’s conditions were good being cool with only the later runners in the marathon having a strong headwind which had picked up for the second half of their race. 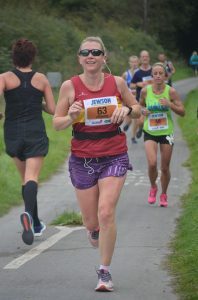 Jo Page was running her first marathon and despite good training times was only concerned about completing the distance. She did this in style with a stunning performance of well paced running to finish in an incredible 3.22.31, coming fifth lady and second in her age category also setting a new overall ladies club record for the distance. The race was won by the brilliant Adam Holland but Okehampton’s Rob Kelly ran a superb race, coming home second male and third overall, setting a new PB of 2.58.09. Hugh Robinson also set a new PB finishing in sixth place with a time of 3.04.37. He was followed by Vets Roger Voaden and Paul Carter finishing in 3.14.25 and 3.16.39 respectively. George Haskell has been improving his times recently and this was reflected in his time of 3.20.53, another PB. Graham Bryant was next in 3.28.00 with Jane Jackson, very relieved to complete having had limited training due to injury, coming home in 4.26.15 to be third FV55. In the half marathon there were more successes with Alec Robinson first home for the club in 1.32.39, followed by Mark Hawkins, in his first race since his achilles injury over a year ago, to set a new PB of 1.38.56. Jo Bradford was keen to put the memory of last year’s run here behind her when she collapsed at the end of the race, but she is a totally different runner now having made huge leaps in improving her times. She finished in 1.48.07, a new PB by an incredible 18 minutes and 20 minutes faster than on this course last year. 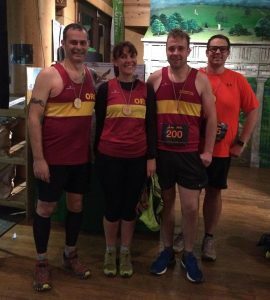 Two other Okehampton runners set new PB’s this weekend, perhaps inspired by the challenges of their club mates. Jane Richardson set a PB at the Exeter Parkrun of 28.15 while John Binns ran a PB at the Tamar Lakes park run of 21.35. 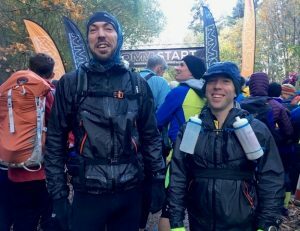 Robert Richards took on a huge challenge to run his first 100mile ultra marathon this weekend. He completed this on Sunday evening after an amazing 34hours 33mins, a new PB of nonstop running/walking and we applaud his massive achievement, more will follow in next week report. Error: Error validating access token: Session has expired on Saturday, 20-Apr-19 03:20:42 PDT. The current time is Monday, 22-Apr-19 11:59:08 PDT.